Pumpkin, cranberries and pecans… Does anything scream November more than that trio? Seriously, I’m pretty sure not a single one of those has ever been left off of our table at Thanksgiving. On Halloween, my family and I had a little pre-trick-or-treating dinner at my house and I decided to make a pumpkin soup in the spirit of being festive. 🎃 I mean we had carved five pumpkins the day before for decorations, but what’s one more? Being at the mercy of not just one, or two, but three little toddlers, ages: 2, almost 3, and 4, I knew there was the possibility that some of us wouldn’t get a chance to sit down and eat, so I had to be prepared with snacks. 💁🏻 I bought a bag of cranberries and a bag of pecans to make some little munchies for everyone to pick at throughout the night. I made some roasted pumpkin seeds—from the soup pumpkin, some sugared cranberries and some cinnamon-sugar-roasted pecans. 8 10 mins. 60 mins. 70 mins. Preheat oven to 425 degrees. Lightly grease a baking sheet with olive oil. Remove the stem from the pumpkin (it should snap off relatively easily). Cut pumpkin in half crosswise. Using a spoon, scoop out the strings and seeds from the inside of the pumpkin. (Reserve seeds for later use). Season each half of the pumpkin with 1 teaspoon of olive oil and salt and pepper. Peel the carrots and chop off the ends. Arrange pumpkins on the baking sheet, flesh side down. Arrange carrots in remaining space on the sheet. 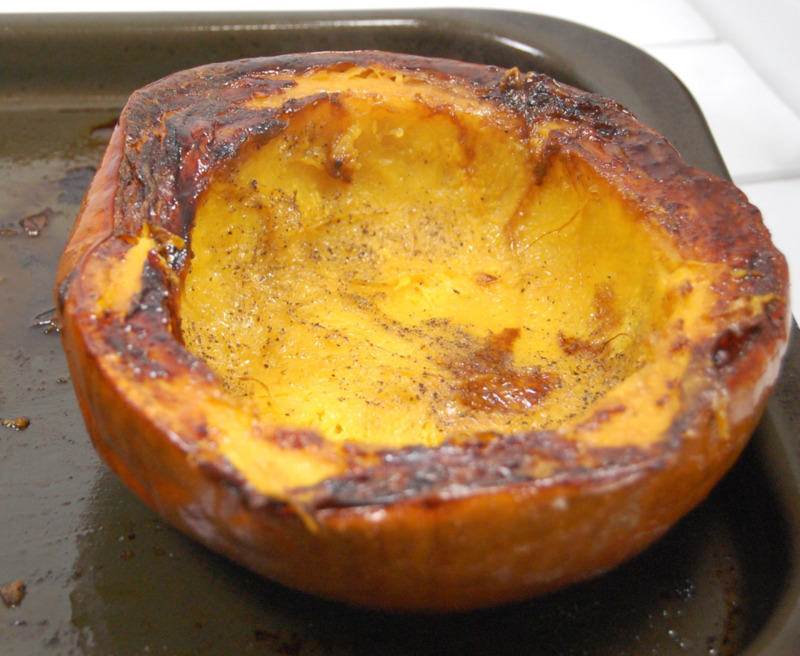 Roast in the oven for approximately 30 minutes until the pumpkin is fork tender. Let them rest until cool enough to handle. Once cool, remove flesh of the pumpkin from its skin and transfer it along with the carrots to a plate and lightly mash it with a fork. After the pumpkin and carrots have roasted for about 15 minutes, begin preparing the rest of the soup. Heat a Dutch oven on the stove over medium heat. Add coconut oil to the Dutch oven. Once the oil is hot, add onion, curry, ginger, cumin, coriander and nutmeg. Sautee the onions and spices until the onions are translucent and soft. Add the garlic to the pot and continue to sautee until the garlic becomes golden. Add the coconut milk, water, pumpkin and carrots to the pot and bring to a simmer. Simmer for about 30 minutes to incorporate all the flavors. Then, remove the soup from heat and blend until smooth and creamy using an immersion blender. If you don’t have an immersion blender, you can blend the soup in batches in a regular blender. While the pumpkin and carrots are roasting, in a small saucepan, combine cranberries, vinegar, sugar, curry, ginger, and cinnamon. Bring to a simmer, and cook, covered, for approximately 30 minutes, until the cranberries have burst and turned into a thick sauce. In a small mixing bowl, toss the pecans in olive oil, cinnamon, nutmeg, paprika and cayenne until the pecans are coated. To serve: spoon soup into a bowl and top with cranberry chutney and spiced pecans. This is another great recipe that gives your toddler a chance to get his or hands dirty! Let your little one help scoop out the seeds and stringy mess from the inside of the pumpkin. Let them do the dirty work and separate out the seeds. Let your toddler pick out and apply seasonings to to the seeds to make their very own healthy snack!